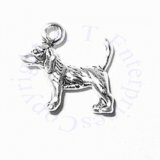 Sterling Silver 3D Small Beagle With Tail Up Dog Breed Charm. Perfect Charm For Any Beagle Breed Dog Or Canine Lover. Description: Sterling Silver 3D Small Beagle With Tail Up Dog Breed Charm. This Charm Comes With A Jump Ring Which Is Not Shown.